Hillary Clinton is there. Ted Cruz is there. So are Bernie Sanders and Marco Rubio. 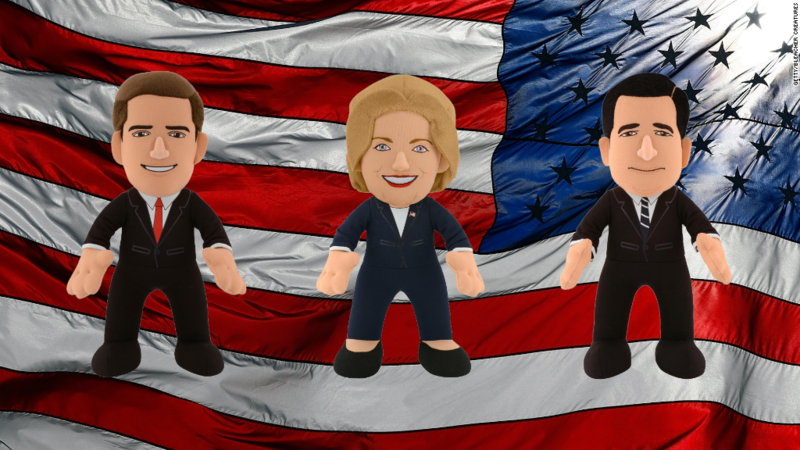 Who's not there in Bleacher Creatures' newest lineup of plush dolls inspired by the 2016 presidential candidates? Donald Trump. Bleacher Creatures is best known for its 10-inch plush figures of famous athletes like New York Yankees' Derek Jeter, Cleveland Cavaliers' Lebron James and the Patriots quarterback Tom Brady. Last year it hit a home run with its Pope Francis doll (selling more than 50,000 of them) to commemorate the papal visit to the United States. On Saturday, Bleacher Creatures will unveil its newest dolls in the likeness of political characters at the North American Annual Toy Fair in New York City. "This is our first foray into politics," said Matt Hoffman, CEO of Plymouth, Pa.-based Bleacher Creatures, which sells more than 1 million dolls a year. Hoffman said early polls determined who got a Bleacher Creatures transformation. So why is Donald Trump missing from the group? Heck, even former presidents Bill Clinton and Ronald Reagan earned a doll. The official explanation from the company is that Trump is a celebrity and celebrity likenesses require licenses. "We worked directly with the Trump Organization and in the end we weren't able to get a deal," said Hoffman. The Trump campaign declined to comment. Hoffman said he has a Trump doll prototype ready if the candidate changes his mind. Hillary Clinton's Democratic rival Bernie Sanders almost didn't make the cut. Hoffman said the company was closely following the early polls to decide which candidates to go with. Sanders' virtual tie with Clinton in Iowa won him his own Bleacher Creatures doll, but too late for the toy fair. 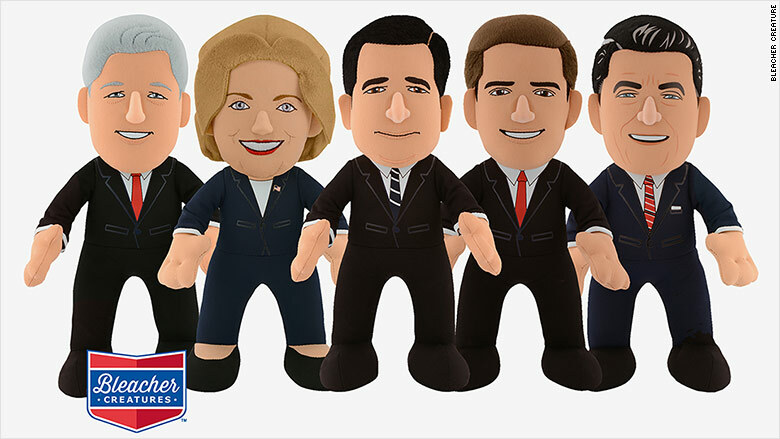 The new political plush dolls (priced at $19.99 each) are on pre-sale on the company's website. 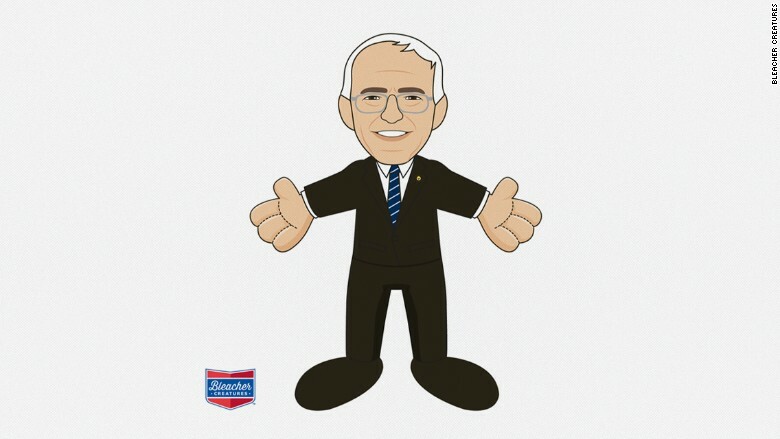 He also said Clinton, whose doll wears a pant suit, could get a wardrobe change in subsequent versions of the doll. Hoffman said the political dolls will ship to customers mid-summer, or 30 days before the Republican and Democratic national conventions.